Repair damaged swards as early as possible Last year’s wet summer and autumn has left its mark on swards, leaving many grass fields in need of restoration this spring, according to Lincoln-based Oliver Seeds general manager, Rod Bonshor (right). 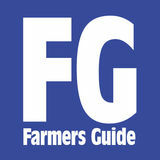 “Having animals and traffic running on soggy, soft fields is never good and, as we come to the end of winter, affected fields are now looking poor,” he said. Grass fields that have large bare patches of soil showing, need over-seeding with large seeded, aggressive species that will germinate and grow away quickly. New distributor for eastern counties Major Equipment has appointed Thurlow Nunn Standen (TNS) as the new distributor for its agricultural and grounds maintenance machines in Norfolk, Suffolk and Cambridgeshire. TNS will be responsible for sales, spare parts and service of the full line of Major products including grass toppers, amenity roller mowers, slurry tankers and slurry application systems. This agreement is part of Major’s long term plan to consolidate its UK dealer network to provide better service to customers. 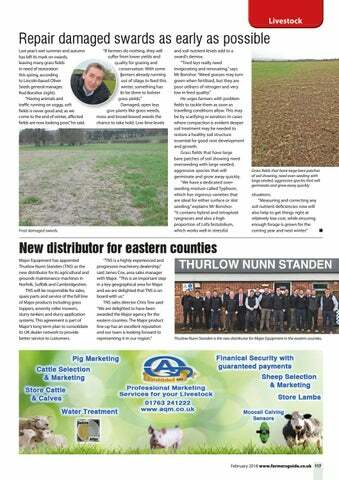 Thurlow Nunn Standen is the new distributor for Major Equipment in the eastern counties.